Black Lenovo C460 is a 21.5-Inch All-in-One touchscreen desktop offering reliable performance in daily tasks of the whole family with its improved Intel Pentium G3240T processor that was released very recently in mid-May 2014 and 4GB memory, ample storage space, Full HD resolution display with touch function and good looks to show off in your house- with great entertainment options and trouble-free daily computing. Lenovo C460 has the 4th generation dual core Intel Pentium G3240T processor (3MB Cache) at 2.7 GHz speed with no hyper threading or turbo boost but the speed is fine as it is, 4 GB DDR3 SDRAM PC3-12800 SoDIMM memory at 1600MHz and 2 memory slots that can be used to upgrade the RAM up to 8GB, 1024 GB Serial ATA hard drive at 7200 rpm rotating speed (tool-less HDD and RAM upgrade) and 64-bit English Windows 8.1 operating system with its familiar desktop start screen option and user-friendly features. 4GB is good amount of memory to run multiple apps and browsers at once and you will probably not be using those very complex and demanding software nor play the latest games on this PC anyway as the Pentium G3240T may struggle a little with those but you can still play the older titles. Having said that, it is an improved Intel Pentium processor with decent performance, competent processing speeds and energy efficiency- 35W maximum TDP, also generating less heat but due to being a dual core without hyper threading, it will allow less processes to be run at the same time. You can manage your files and data easily and efficiently with the Lenovo Assistant systems manageability tool. 21.5 inch Full HD LED backlit Active Matrix TFT Color LCD screen with 1920 x 1080 pixel resolution comes with a responsive 5-point multi-touch function to navigate smoothly through the Windows 8.1 apps and the integrated Intel HD graphics card offering decent image quality with vivid colours- ideal for home entertainment. You get powerful and clear sound through the Dolby certified stereo speakers for your songs, movies and games. It comes with a 720p high definition webcam with an integrated microphone for live chats on Skype and look your best. 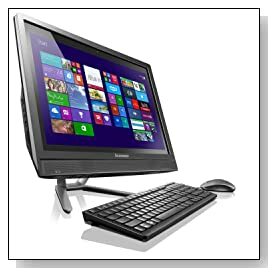 Lenovo C460 weighs 17.6 pounds with dimensions of 17.2 x 21.26 x 2.24 inches, has that modern business-like good looks with the matte black on silver white stand combination that is made of solid plastic but still has a sturdy feel. It comes with a wired island style AccuType keyboard with ergonomic keys and 10-key numpad for easier data entry and a wired USB mouse. Connectivity options are Optical DVD drive DVDRW, IEEE 802.11b/g/n wireless LAN, Bluetooth 4.0, 6-in-1 Memory Card Reader supporting SD, SDHC, SDXC, MS, MS Pro and MMC, Gigabit Ethernet with RJ-45 port, 4 x USB 2.0 ports, 2 x USB 3.0 ports, an HDMI port, Audio Line In and Out and a Security Slot. 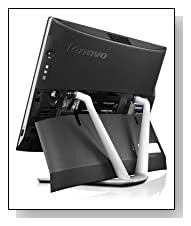 Conclusion: Lenovo C460 is a decent 21.5 inch screen All-in-One desktop for everyday use in light to medium operations with generous storage space at 7200 rpm rotating speed (faster read and write times), 4GB memory that can be upgraded to 8GB and tool-free expandability by sliding the bottom part of the back panel, Full HD screen and Dolby Advanced Audio with stereo speakers. It will look good on any desk and will reduce clutter giving you more space, performs well, has a sturdy build and is offered at a fair price. *International and innovative Lenovo is one of the global leaders in the computer industry, creating high quality, reliable and modern PC products for work, school or home use.